Designed by the Philippine Institute of Science and Technology in conjunction with the Philippine Air Force. the XL-15 is an air ambulance bu ilt entirely of local woods. Span 39 ft. 5 in. ; length 27 ft. 2 in., engine 190-h.p. Lycoming; loaded weight 2.750 lb. ; max. speed 135 m.p.h. XL-15 TAGAK. As part of a programme of research and study to investigate the possibilities of aircraft construction in the Philippines, the Institute of Science and Technology, Manila, designed and built the XL-14 Maya. Main object was to test the application of local materials, such as home-grown woods, plywood and bamboo. 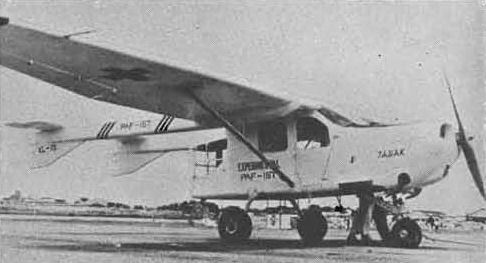 A second aircraft, the XL-15 Tagak, developed as a joint project of the Institute and the Philippine Air Force, has been undergoing flight evaluation tests since October 1954. Powered by a 190-h.p. Lycoming O-425A engine, the Tagak is a general purpose monoplane which can be used for ambulance duties, and two stretchers and a medical attendant can be carried. Alternatively the Tagak can seat four persons . Structure is entirely of local woods, plywood, and "Wobex " (Woven Bamboo Experimental, which is a form of reinforced woven bamboo). Salient features: The pod and twin-boom layout of the Tagak make it unmistakable in the air . 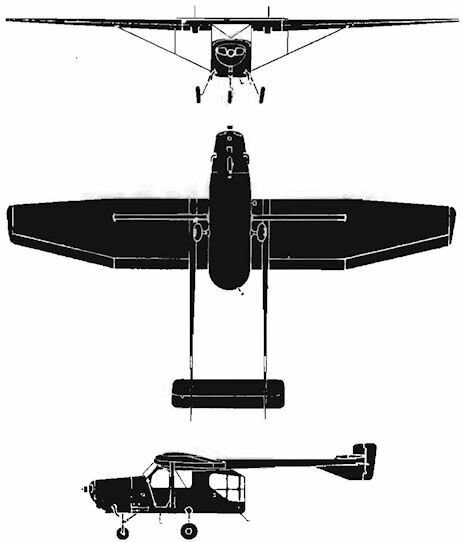 Fuselage is angular and cabin and rear fuselage have large transparencies. The high-mounted wing is of constant chord, and tapers sharply on the trail ing edge and slightly on the leading edge.